To spell the words of a foreign language is not an easy task but it’s crucial in order to learn the language. Mingoville has developed different English spelling games where the kids through pictures, clues, sound and movement learn to spell English words by playing with them. Lately, I have been writing about the different games and their educational purpose in Mingoville Virtual World. Some of you have commented that you find it hard to create an overview of the learning possibilities because the virtual world is not linearly structured and it has many maps (areas). However, it is fun for the kids to discover the different maps and what to do on these maps which is why we do not make an overview of where to find what. It takes too much of the fun away. Instead, I have written a short description of each game to give at least an overview of what games to find. In the end, after the last game post, the idea is to gather all games in one place and in that way try to give you an overview of the educational content in the virtual world. So far I have covered SuperStar where the kids learn English singing, recording songs and giving concerts, QuizTalk where the kids practice English pronunciation and listening, and the Boat Races where the kids practice to recognize different words in a fun setting. 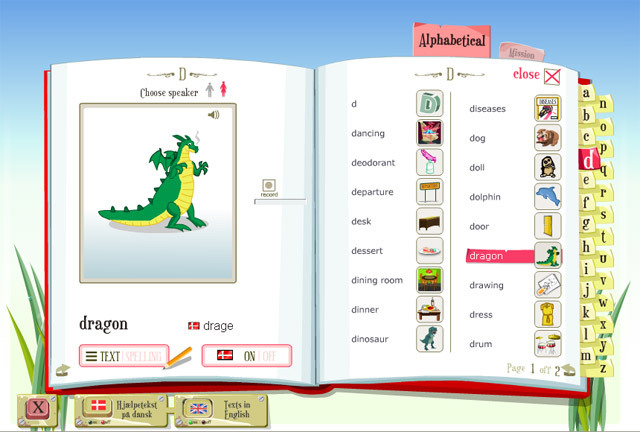 Spelling is an important part of all language learning and we have of course also developed spelling games. 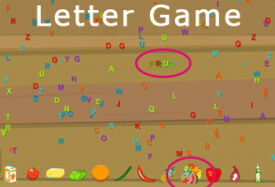 In the LetterGame, the kids see different images of words that he/she needs to spell by clicking on the image and listening to the pronunciation of the word. After the word has been pronounced, the child begins to chase the letters to compose the word in writing. The letters have to be put together in a string to form the word. The letters have to be dragged around the board to put the word together. If the letter is wrong the string will turn red and break. 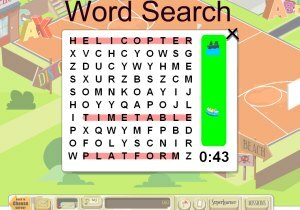 In the other spelling game, Word Search, the kids need to recognize words either horizontally, vertically or diagonally. The words are shown in images in the green sidebar to the right. When mousing over the picture, the word appears and the student is ready to find it in the puzzle. I personally like this game a lot, I can spend hours in there. 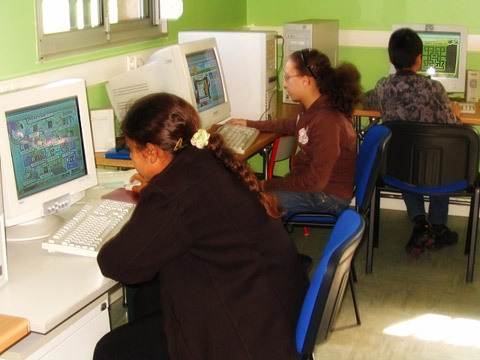 Both games develop the student’s ability to create an overview of complex content. 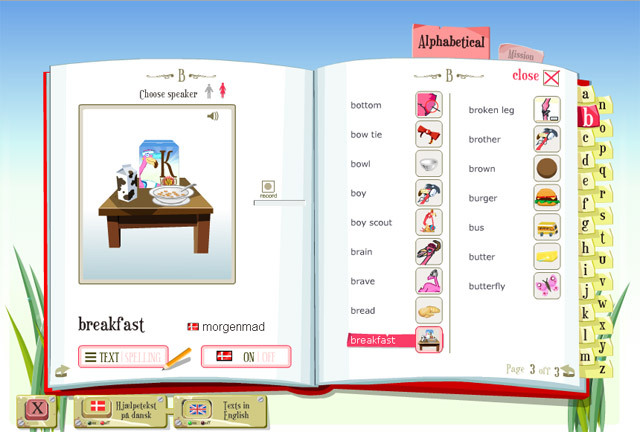 In both games, the student has to detect specific words by resorting to the use of images. As in all the other games, the students earns coins based on how many words are spelled and the time it takes to spell them. After each game the score list will appear and the student can see his or her position on the different score lists, e.g. by country, the world, today, weekly, monthly or all times. The score lists make it possible to set up competitions based on, for instance, Country and Today to encourage students to improve their spelling skills. As always we welcome comments and suggestions. Mingoville Virtual World teaches kids English through fun games. Most kids get it right away. When they see a new game in Mingoville, they explore it and figure out how it works along the way. The more games and interaction, the happier they are and the more they learn. For some grownups though, it may be harder to understand what all these social and virtual games are about. 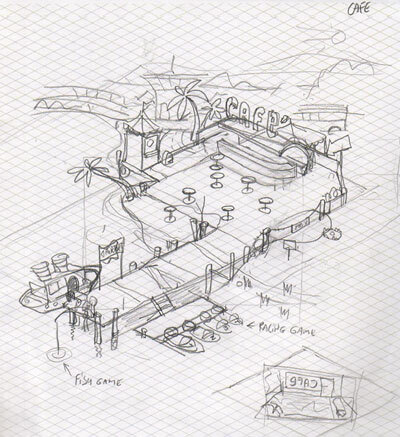 Some time ago, we promised that we would write in more details about what’s going on in the Mingoville new Virtual World. 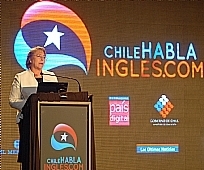 How do the kids learn English in a social learning community? The following blog posts will provide a good overview of the different learning games inside Mingoville. This first post is about our “Quiz Talk” game that is located in the Café area around the coffee tables in Mingoville Virtual World. As much of the buzz around virtual worlds is related to the socialization within these communities, we also take advantage of the social possibilities within Mingoville community to make it more fun for the kids to learn English. According to Gigaom, what makes gaming social is the ability to create and build relationships with friends while playing the game. 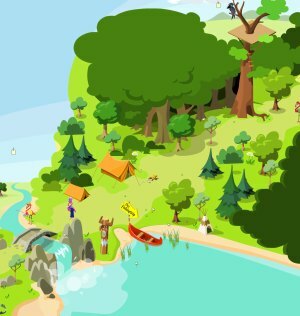 The Quiz Talk is a social learning game that allows students to develop their social skills as well as their ability to understand English spoken by other people around the world. It is social in the way that it requires two players, and the players have to cooperate and interact to win. 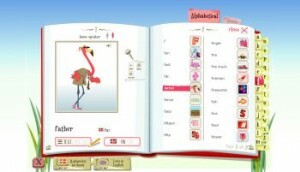 The Quiz Talk uses the recorded words in the interactive dictionary of each student and creates a “conversation” between the two students playing the game. They have to guess each other’s words by choosing one out of the three pictures. The kids have to record at least 5 words in their interactive dictionary to play the Quiz Talk. The recorded words from the dictionary appear at the top bar inside the game. The more words they record and play for their buddies, the more points they gain. The game: You pick a word and play it for your buddy. Your buddy listens to your word and has 3 pictures to choose from. He or she has to pick the picture that relates to your recorded word. If he picks the right picture, you both gain points. If he picks the wrong picture, none of you get points. The faster he guesses your word, the more points you both get. Instead of competing, the game is based on cooperation in the sense that the students have to put an effort into the correct pronunciation of the words to ease the task of the co-player. The quiz also strengthens the kids’ capability of understanding other accents/dialects. While making new friends, the student practices pronunciation, reading, understanding and spelling. This is what we call social learning. What Do We Plan for the Future? Listening to the voice of the “buddy” gives the kid a feeling of getting closer to the co-player, getting to know him better. This social aspect of the game turns the usual virtual buddy, whom you generally don’t really know, into a real friend. The future development of the Quiz Talk will focus on making the conversation even more social and personal. E.g. this could be to turn words into sentences about your family maybe even include the possibility of uploading pictures of your family into your dictionary that will be displayed in the Quiz Talk. The student will find the English learning more relevant and fun when it involves part of his own life. 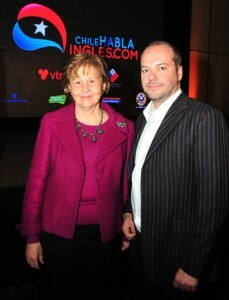 It may even function as an intercultural exchange of different ways of living. The development of an English game will always be based on our knowledge of what kids want, latest technologies and it will always have an English learning aspect. Sign up or log in to try the game. What do you think? As always we welcome any comments or suggestions. 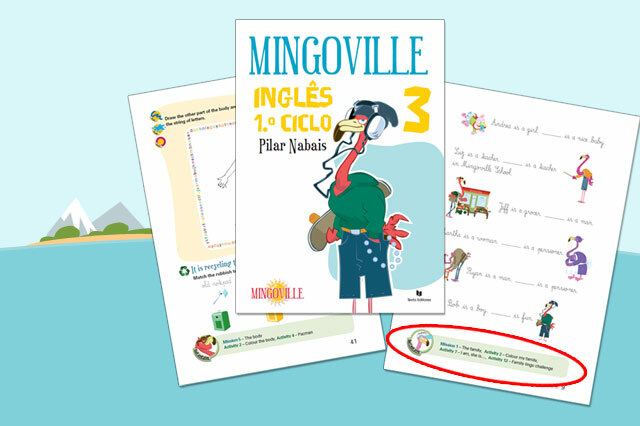 A Portuguese publishing house, Texto Editores, has designed and produced 4 English books for children based on the Mingoville’s interactive English program (www.Mingoville.com). 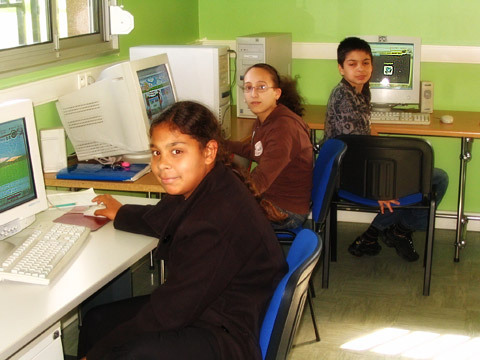 Texto Editores is to sell the books to the Portuguese public and the schools, some of which are already using the Mingoville program in their English classes. Publishing houses like Texto Editores have started to look after interactive online content providers to supplement their expertise in producing print materials with the interactive content. Now they’ve teamed up with Mingoville. That is the great news for everyone. Most importantly, it provides a complete integration of off- and on-line teaching material and makes it more fun for the kids to learn English. Both can be used independently from one another making the integration even more dynamic and engaging. Hopefully, other publishers will recognize the trend and we will see English books based on the Mingoville content in other corners of the world as well. For instance there is a small recycling exercise where kids have to throw the rubbish into the right recycling bin. This is definitely a very good idea especially now when everybody is focusing on the green economies and the climate. To start with, some 40,000 copies of the four books will be available in Portugal. We really hope the Portugese kids will enjoy the interlink between the Mingoville books and the online program even more now. Feel free to write us your comments as we are always open to suggestions. It is time to write an update on the progress of the Mingoville MMOEG (Massively Multiplayer Online Educational Game) that we recently announced about on our blog. We are going the full speed with building an exhilarating educational experience for kids who want to learn English as a second language (ESL) and have fun by playing exciting games. Recently, we’ve been doing a lot of testing, the results of which we will share next time. 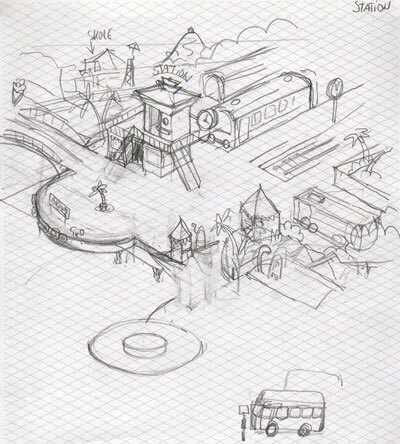 Until then we wanted to show you some of the MMOG maps (drawings) to be found in the Mingoville Virtual World. 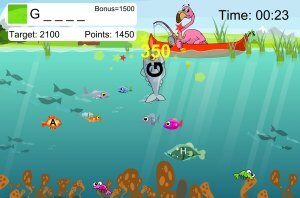 Cafe Map – this is where you are going to meet your buddies, start the conversation game, the racing game, the fish game and much more. 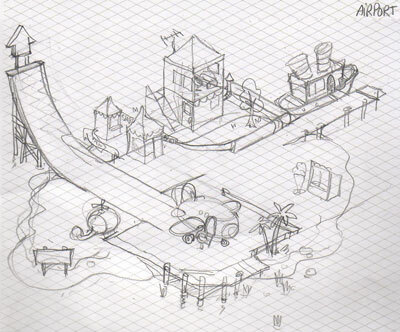 Airport Map – Here you can take tours, get ice-cream and water tour as well as stand at a table in groups and chat (launched by hitting the tables). Station Map – There is a good public transportation system in Mingoville. Just letting you know that 155 new words are being added to the Mingoville dictionary. We are testing the new additions and they will be out for use next week. Here are some shots of the new words. Like in our current dictionary, it is still possible to listen to and record your own English pronunciation. However, this time we are adding a new feature, that is, an option to listen to both female and male voices. All you need to do is to select a preferred option at the top of the page to the left above an image (see below). We hope you enjoy the new words and the new feature in the dictionary. Leave us your comments if you have any feedback or any other suggestions you may have.